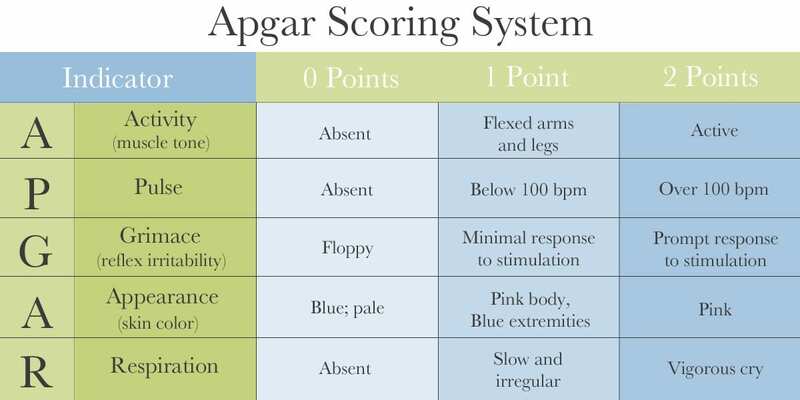 The Apgar score is a simple method of quickly assessing the health and vital signs of a newborn baby. It was created by Dr. Virginia Apgar in 1952 (1). What does APGAR stand for, and what does it measure? This is an evaluation of the baby’s skin color. The medical team measures if the baby blue or pale all over, blue at the extremities, or pink all over. During this evaluation, the medical team measures if the baby’s heart rate is absent, slow (<100 beats per minute (bpm), or fast (>100 bpm). During this evaluation, the medical team asks if the baby lacks a response to stimulation, responds with a grimace, or responds by crying and pulling away. During this evaluation, the medical team asks if the baby is limp, if the baby has some flexion (joint movement), or if the baby shows active motion. During this step, the medical team asks if the baby is failing to breathe, if the baby has a weak cry and slow breathing, or if the baby is breathing well and crying normally (1). How was the Apgar test developed? At the time Dr. Virginia Apgar began her career, women had great difficulty entering the field of medicine. As Erin Blakemore noted in a piece for Time Magazine, “Women who did attain a medical degree were often shunted into obscure specialties or discouraged by their male colleagues, and it was no different for Apgar.” In her case, that obscure specialty was anesthesiology. Apgar began studying how anesthesia could impact mothers and babies. One day, a medical student asked her how to evaluate the health of a newborn baby, and she simply scribbled a list of what she considered to be the most important signs. Then she realized that those signs could be combined into a formal assessment tool to indicate whether a baby requires medical intervention. Apgar tested this method, and found it to be effective (2). When is Apgar testing done? Apgar testing is typically done at one and five minutes after a baby is born, and it may be repeated at 10, 15, and 20 minutes if the score is low. The five criteria are each scored as 0, 1, or 2 (two being the best), and the total score is calculated by then adding the five values obtained (1). What do Apgar scores mean? The lower the Apgar score, the more alert the medical team should be to the possibility of the baby requiring intervention. For example, a baby with a low score is more likely than a baby with a high score to need resuscitation (4) (however, it is important to note that in certain cases, resuscitation must be initiated prior to determining the Apgar score). Some components of the Apgar score are subjective, and there are cases in which a baby requires urgent medical treatment despite having a high Apgar score. A low one minute Apgar score immediately after birth may not indicate that the baby will have long-term health complications (1). However, there is evidence to suggest that infants whose Apgar scores remain low at five minutes or later are much more likely to suffer long-term neurological damage. For example, Martina Persson and colleagues (5) recently found that babies with lower Apgar scores at five and 10 minutes were at greater risk for developing cerebral palsy (CP) and epilepsy. Likewise, Kari Kveim Lie and colleagues (6) found a significantly increased risk of cerebral palsy in infants who had low Apgar scores at the five-minute mark. This was especially true of children born at a normal birth weight. Higher Apgar scores, however, do not rule out the possibility that the baby has a brain injury, such as hypoxic-ischemic encephalopathy (HIE) (6). In these cases, physicians must recognize other signs and symptoms of damage and treat them quickly and appropriately. What can cause low Apgar scores? When a child has a brain injury such as HIE or cerebral palsy, it is imperative that experts rely on objective scientific methods and direct observation to determine if the child was exposed to damaging hypoxia/asphyxia around the time of birth. Clinical markers should be examined and all possibilities of causes explored so that the cause and timing of the brain injury can be pinpointed. What happens if my baby has a low Apgar score? Some babies with low Apgar scores at birth go on to be perfectly healthy, although they likely require medical intervention shortly after birth (1). Oftentimes, infants with low Apgar scores or other risk factors will be moved to the neonatal intensive care unit (NICU) in order to receive appropriate care. Common medical interventions for newborns with low Apgar scores may include resuscitation, hypothermia therapy (in cases of HIE), and many other preventative treatments. What is an assisted Apgar score? Apgar scores assigned during resuscitation cannot accurately be compared to scores from infants who are breathing spontaneously, because the resuscitation will change the variables under consideration. In such cases, an “assisted” Apgar score must be used to take into account the resuscitation. The American College of Obstetricians and Gynecologists (ACOG) recognizes this concept and recommends using an “expanded Apgar score report form,” which is available here (1). How do you pronounce Apgar? When delivery complications arise, it is the responsibility of the medical team to act quickly and appropriately to minimize the risks to the mother and baby. Failure to appreciate the significance of a low Apgar score, or to provide interventions that a baby needs, is negligence. If this negligence results in injury to the baby, it is medical malpractice. 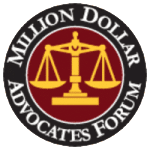 Due to the complex nature of birth injury (infant malpractice) cases, it is essential to work with an attorney or attorneys that have a lot of experience in the field and are skillful at reading lengthy and complex medical records. In addition, the attorney should be very knowledgeable about the science involved in birth injury cases. 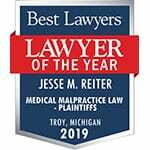 Jesse Reiter has decades of relevant experience, and his practice focuses exclusively on birth injury. He has helped numerous families whose children have HIE, cerebral palsy, and other health issues. Many of his cases involve the use of Apgar scoring. 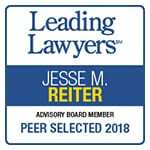 “Jesse Reiter is a remarkable and well experienced birth injury lawyer. We hired Reiter & Walsh after reading about Mr. Reiter’s professional profile and years of experience. We were very happy with the services he provided and admire his professional excellence. He conducted professional and ethical manners; he worked with great dignity. Throughout the legal process, we were informed. They’re inspiring lawyers with a purpose. Our family was blessed to have them walk us through the legal process that was foreign to us at the time. They worked for us 24/7 and were never too busy to answer all our questions. We absolutely loved working with them! Persson, M., Razaz, N., Tedroff, K., Joseph, K. S., & Cnattingius, S. (2018). Five and 10 minute Apgar scores and risks of cerebral palsy and epilepsy: population based cohort study in Sweden. bmj, 360, k207. Aliyu, I., Lawal, T. O., & Onankpa, B. (2018). Hypoxic-ischemic encephalopathy and the Apgar scoring system: The experience in a resource-limited setting. Journal of Clinical Sciences, 15(1), 18.